For over 50 years, Lewanda B. Lim, a Filipino-American artist, has created a multifaceted oeuvre. She expresses her ideas and feelings through varying mediums, styles and topical orientation. Lewanda works with oils, acrylics, watercolors, print materials, fabrics, yarns, dyes. The gamut of her styles reflects a restless and curious mind willing to pivot in any direction that interests her. Her Palengke (“marketplace”) series shows her attempts to capture market scenes through her own brand of realism which she employs in many other subjects. Abstract expressions and bits of surrealism reflect her playfulness and compositional daring. She is a politically oriented artist and this philosophical bent is manifested in many of her works, particularly in her series, Telling Our Story and her recent large fiber collages. She is also a published poet and jewelry maker. Lewanda has a Bachelor of Fine Arts degree (Art Education) from the University of the Philippines and a Master of Art (Studio Art) from the State University of New York (Albany). 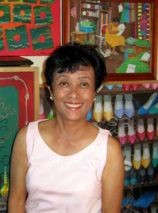 Before immigrating to Canada in 1976, she taught art at the University of the Philippines for several years. Lewanda has had several one-woman and group shows in Manhattan, Upstate New York, Philadelphia, Massachusetts, and Ohio. She currently lives in Ohio with her husband and their many plots of vegetable and flower gardens. Currently, she is working on a collaborative project with her daughter entitled "Mga Kwento". Follow her on Instagram Instagram. Donate to help create a full-color Artbook for "Telling Our Story" here.